Background and objectives: This study set out to determine the incidence of hypoglycemia in patients with chronic kidney disease (CKD), with and without diabetes, and the association of hypoglycemia with mortality. Design, setting, participants, & measurements: This was a retrospective cohort analysis of 243,222 patients who had 2,040,206 glucose measurements and were cared for at the Veterans Health Administration. CKD was defined as an estimated GFR of <60 ml/min per 1.73 m2. Hypoglycemia was set at <70 mg/dl. Mortality was measured 1 day after glucose measurement. Results: The incidence of hypoglycemia was higher in patients with CKD versus without CKD. Among patients with diabetes, the rate was 10.72 versus 5.33 per 100 patient-months and among patients without diabetes was 3.46 versus 2.23 per 100 patient-months, for CKD versus no CKD, respectively. The odds of 1-d mortality were increased at all levels of hypoglycemia but attenuated in CKD versus no CKD. Adjusted odds ratios for 1-d mortality that were associated with glucose values of <50, 50 to 59, and 60 to 69 mg/dl, respectively, versus glucose of ≥70 mg/dl were 6.09, 4.10, and 1.85 for inpatient records from patients with CKD; 9.95, 3.79, and 2.54 for inpatients records from patients without CKD; 6.84, 3.28, and 3.98 for outpatient records from patients with CKD; and 13.28, 7.36, and 4.34 for outpatient records from patients without CKD. Conclusions: CKD is a risk for hypoglycemia, with or without diabetes. The excessive mortality associated with hypoglycemia makes this complication a significant threat to patient safety in CKD. Diabetes is the most common cause of kidney disease worldwide and is a frequent comorbidity in patients with nondiabetic nephropathies (1). A key goal for diabetic treatment in patients with chronic kidney disease (CKD) is rigorous glucose control to prevent ESRD (1); however, diabetes management in the CKD population warrants special considerations. Because insulin is renally cleared, patients who have diabetes and have CKD with reduced GFR (<60 ml/min per 1.73 m2) frequently have lower insulin requirements (2). In addition, degradation of insulin in peripheral tissues is decreased in patients with CKD (3). Patients with CKD and uremia may also become anorexic with suboptimal nutrition, leading to reduction in glycogen stores (4). Moreover, with a decline in renal mass, patients with CKD may experience reduced renal gluconeogenesis (3). Finally, commonly used antidiabetic drugs are renally excreted and have a prolonged half-life in patients with CKD, predisposing them to episodes of hypoglycemia. The confluence of these factors may contribute to a greater risk for hypoglycemia among patients with CKD and may be an unintended consequence of therapy to treat hyperglycemia. Hypoglycemia can be considered a serious patient safety event with severe health complications, including dizziness, disorientation, slurred speech, convulsions, and death (5,6). In addition, acute hypoglycemia can result in a surge in adrenergic activity, which can result in coronary ischemia, serious cardiac arrhythmias, and sudden death (7). Such adverse consequences of hypoglycemia may at least partially explain the greater risk for cardiovascular disease (CVD) outcomes observed in at least three recent studies of intensive glucose lowering in patients with diabetes (8–10). No epidemiologic studies have examined the incidence of hypoglycemia among patients with CKD, determined its significance, or estimated to what extent it might contribute to the excessive mortality rate associated with CKD. In this study, our primary objective was to examine a large national cohort of patients to determine the incidence of hypoglycemia in patients with versus without CKD, both with and without diabetes. We also examined the association of hypoglycemia with subsequent near-term mortality in this population. This was a retrospective cohort study of a national data set of patients who were cared for in the Veterans Health Administration (VHA). Patients in the cohort were observed during VHA fiscal year 2005 (October 1, 2004, through September 30, 2005) for hypoglycemia or death. The setting and data sources used for this study have been described previously (11). Briefly, the VHA national health care system is considered the largest integrated national health care system in the United States, with 4.6 million veterans receiving care at a VHA facility in 2002 and >35 million outpatient visits annually (12). The study data were abstracted from several VHA data sources housed at the VHA Corporate Data Franchise-Austin (formerly the Austin Automation Center) and the VA Information Resource Center. The study data set was derived from the VHA fiscal year 2005 acute inpatient data files (Medical SAS Inpatient Datasets) and linked to inpatient and outpatient laboratory data (Decision Support System Laboratory Result), outpatient event data sets, and vital statistics data for those veterans (13). Dates of death from vital statistics were generated from four different sources, resulting in an a >95% agreement on vital statistics, using the National Death Index as a gold standard (14). This study was approved by the institutional review board of the University of Maryland, Baltimore, and the Research and Development Committee of the Maryland VA Healthcare System. Study participants were veterans who were included in a cohort that previously was assembled to determine the risk for patient safety events associated with CKD (11). The study participants had at least one acute care hospitalization during the period of October 1, 2004, through September 30, 2005, and at least one outpatient measure of serum creatinine between 1 wk and 1 yr before their index hospitalization. When multiple serum creatinine records were available for a participant, the one closest to the hospital admission was selected to estimate GFR (eGFR) using the four-component Modification of Diet in Renal Disease (MDRD) equation (15). The eGFR was used to determine CKD classification, on the basis of whether the value was <60 ml/min per 1.73 m2 (15,16). The participants were required to have complete demographic data (race, gender, and age) for determination of eGFR and at least one glucose measurement (inpatient or outpatient) during the study period. The key study measure was hypoglycemia, which was defined using three threshold groups: <50 mg/dl (2.78 mmol/L), 50 to 59 mg/dl (2.78 to 3.28 mmol/L), and 60 to 69 mg/dl (3.33 to 3.83 mmol/L). The selection of these cut points was derived from definitions of hypoglycemia used in previous studies (5,17,18), but because none of them was used exclusively, we elected to incorporate all of them as measures of hypoglycemic severity. For covariates, we considered gender, race (white/black/other), age by quartile rounded to the nearest full year (18 to 56, 57 to 64, 65 to 75, ≥76), and comorbidities (diabetes mellitus, CVD, cancer excluding nonmelanomatous skin cancer), and the Charlson comorbidity index (CCI) (19). The CCI was computed for each patient for descriptive purposes; the CCI was modified to exclude CKD, diabetes, CVD, and cancer because they were included as separate covariates in the analysis. Both malignancy and metastatic solid tumor codes were included in the cancer classification. Patients were classified as having CVD when they had diagnosis codes for congestive heart failure, myocardial infarction, or stroke. All of the comorbidities were determined cumulatively using International Classification of Diseases, Ninth Revision codes from inpatient and outpatient VHA records from October 1, 1999 (first available data), to the admission date of the index hospitalization. Our two primary outcomes were hypoglycemia and death. Hypoglycemia was determined from inpatient and outpatient venous blood draw glucose values during the study period. The data set included a wide range of values of glucose for each study participant across variable times of observation (1 to 394 d). When there was more than one glucose record per patient in a single day, the record with the lowest glucose value from that day was selected for inclusion in the data set. To determine incidence of hypoglycemia, we expressed the frequency of events (in each mutually exclusive hypoglycemia category) per 100 patient-months in the study period. We chose mortality within 1 day as a primary outcome (1-d mortality) to determine the significance of hypoglycemia after its occurrence,. The short time interval was chosen to ensure a feasible link between the hypoglycemic event and mortality event and to minimize the effect of potential case-mix confounders on this association, which accrue with increasing observation time. Because the data sources did not document the time of glucose record within a given day or the time of death, we elected to link glucose records to deaths either the day of or the day after that record (0 to 48 h) to associate glucose events to proximate death events. When more than one hypoglycemic event occurred during the 48-h period preceding death, only the earlier event was retained. To determine the association between mortality and hypoglycemia, we linked survival status to each glucose event, because any given veteran could have several glucose events during the study period. For descriptive analyses, we reported means, medians, and SE for continuous variables and frequencies for categorical variables across groups defined by CKD status and by severity of hypoglycemia. To determine the incidence rates of hypoglycemia in individuals with and without CKD and diabetes, we used Poisson regression allowing for covariate adjustments. The denominator (offset) was calculated by summing all months per patient in the observation period because of variable follow-up times. We reported adjusted incidence rates (events per patient-month) using the average value of each covariate. To determine the risk for mortality associated with a hypoglycemic event, we calculated the odds ratio (OR) of 1-d mortality using a generalized estimating equation, which accommodates multiple and variable frequency of glucose records along with repeated vital statistics assessment within each patient while controlling for multiple confounders (20). We used a simple correlation structure that assumed that the correlations between repeated measures were equal. We calculated OR of 1-d mortality for patients in subgroups on the basis of CKD status and glucose category and for both outpatient and inpatient records separately. The reference group for each OR was the set of records classified as no CKD with normal glucose (≥70 mg/dl). Adjustment covariates for these models were age, race, gender, CCI, diabetes, cancer, and CVD. The base study cohort contained 247,176 patients; of these, we excluded 3954 because of missing index GFR (n = 16) or missing glucose values (n = 3938). The resulting analysis file contained 243,222 individuals with 2,040,206 records representing individual glucose measurements. Table 1 lists characteristics of the study population grouped by CKD status as well as lowest glucose level. Patients with CKD were more likely to be male, white, and older than patients without CKD. Patients with CKD were also more likely to have diagnoses of cancer, diabetes, and CVD and a higher CCI than patients without CKD. Patients who experienced hypoglycemia were more likely to be male, black, and older than patients without hypoglycemia. Patients with hypoglycemia were also more likely to have a greater number of comorbidities and more likely to have cancer, diabetes, CVD, and each stage of CKD. In each of these categories except cancer, these trends were more pronounced with hypoglycemia of increasing severity. Table 2 categorizes the patients into four groups on the basis of CKD and diabetes status. For each of these groups, the total number of hypoglycemic events, based on lowest daily glucose value, was summed per cumulative patient-month of observation. A total of 73,551 hypoglycemic events were detected (3.6% of all glucose records), with more severe hypoglycemic events (classified into exclusive groups) being relatively less frequent. The adjusted rate of hypoglycemia, regardless of severity and within diabetes strata, was higher in patients with CKD than those without CKD. Likewise, the rate of hypoglycemia among patients with diabetes, across the range of severity, was higher than in patients without diabetes. Patients who had both diabetes and CKD had substantially higher rates of hypoglycemia than either disease state alone. 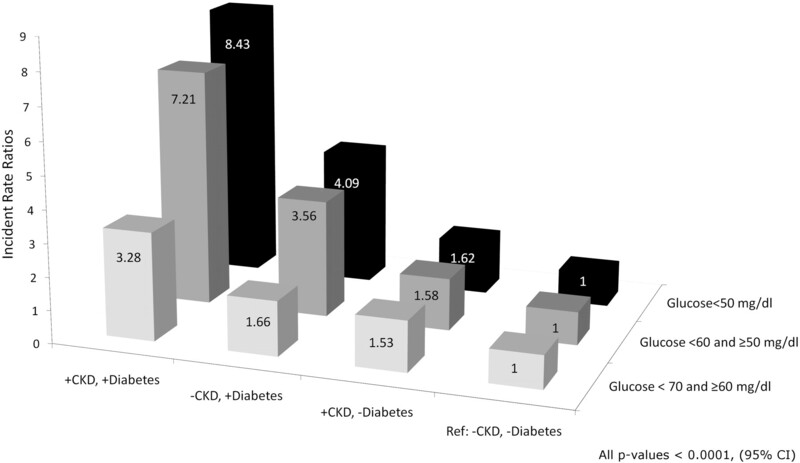 Figure 1 shows the adjusted incidence rate ratios of a hypoglycemic episode in each subgroup classified by CKD with or without diabetes compared with the reference group of no CKD and no diabetes. The risk for hypoglycemia, regardless of severity, is increased in the presence of either diabetes or CKD, with the risk most pronounced in the presence of both conditions (P < 0.0001 for the interaction of diabetes and CKD). The risk for the most severe hypoglycemic events was highest in the group with both diabetes and CKD. Risk for hypoglycemia of varying severity and expressed as an adjusted incidence rate ratio in veterans classified by presence or absence of chronic kidney disease (CKD) and diabetes. Reference group are veterans without CKD or diabetes. Rates adjusted for race, gender, age, Charlson comorbidity index, cancer, diabetes, and cardiovascular disease (all rate ratios P < 0.0001). A total of 6793 patients (2.8% of total patients) died within 1 d of a blood draw recording glucose values. In Table 3, the adjusted odds of 1-d mortality associated with a hypoglycemic event is shown for each glucose category, in the presence or absence of CKD, and for both inpatient and outpatient events. In the inpatient setting only, the presence of CKD with normoglycemia was a risk factor for slightly increased 1-d mortality. With or without the presence of CKD, the odds for death within 1 d of a hypoglycemic event was increased relative to no CKD and a normoglycemic event, for both inpatient and outpatient values, and the odds increased with severity of hypoglycemia. Of note, there was the tendency of lower odds for death with a hypoglycemic event in the presence of CKD relative to the corresponding severity of hypoglycemia with no CKD. The proportion of all glucose events classified as hypoglycemic was higher among inpatient records than outpatient records (28,976 [4.06%] of 1,205,211 and 24,575 [2.94%] of 834,995, inpatient and outpatient records, respectively). Although hypoglycemic events were more common among inpatients, the relative increase in the odds for death associated with hypoglycemia was higher in the outpatient setting. In a national cohort of veterans observed during 1 yr, the diagnoses of CKD and diabetes both were independent risk factors for hypoglycemia of any severity. CKD and diabetes interacted significantly, leading to a greater risk for mild to severe hypoglycemia in the presence of both diseases than that observed in either disease state alone. The clinical implications of hypoglycemia's occurring in either an inpatient or an outpatient setting was evident in its association with 1-d mortality; however, the relative risk for death was greater with outpatient hypoglycemia. The risk for mortality was to some extent attenuated among patients with the diagnosis of CKD versus those without. It is likely that the occurrence of hypoglycemia in patients with diabetes, with or without CKD, is largely related to use of diabetic therapies; however, in the case of patients without diabetes and with CKD, the underlying cause for hypoglycemia is not entirely clear. The association between hypoglycemia and mortality was striking and consistent with the anticipated consequences of this metabolic disturbance. The “dose-response” relationship between severity of hypoglycemia and risk for mortality supports the likelihood of a causal relationship; however, the reduced risk for mortality in patients with CKD was unexpected and could relate to an unmeasured increased intensity and quality of care in this patient population relative to patients without CKD. The higher frequency of hypoglycemia in both CKD subgroups with and without diabetes and the associated increased mortality may account for some portion of the excess cardiovascular morbidity and mortality seen in CKD. Studies demonstrate that hypoglycemia is associated with cardiac disturbances and an increased incidence of death (7,18). In addition, the Action to Control Cardiovascular Risk in Diabetes (ACCORD) study in 2008 showed that patients who had type 2 diabetes and were on an intensive glucose-lowering program had an increased rate of death from all causes and from CVD compared with patients who received standard therapy (8). It is plausible that the increased mortality in the intensive treatment arm could be attributable to hypoglycemia, although this was not entirely clear in ACCORD. Both the Action in Diabetes and Vascular Disease: Preterax and Diamicron Modified Release Controlled Evaluation (ADVANCE) and the Veterans Affairs Diabetes Trial (VADT) found that severe hypoglycemia was more common in an intensive glucose-lowering group than a control group, but the two treatment groups had similar mortality rates (9,10). As with all retrospective analyses, there are some inherent limitations to consider. The data set was based on administrative data, which is subject to data recording errors and the potential for nonrandom differences in frequency of laboratory measures between exposure groups. Conversely, a large administrative data set, such as that examined here, offers an opportunity to examine relatively uncommon events such as those related to patient safety. Differences in severity of illness and comorbidity may have led to more hospitalizations and frequency of laboratory measurements, and increased surveillance may lead to detection of more hypoglycemia in high-risk groups; however, our findings on the impact of hypoglycemia showed similarly significant trends for both inpatient and outpatient records, with the latter representing a setting in which such factors would likely be less of a factor. Moreover, the patient population was preselected to have at least one hospitalization, ensuring a higher degree of comparability between those with and without hypoglycemia than if the entire population of veterans were chosen. In addition, variations in illness severity were further adjusted for with the CCI. The choice of examining the association between hypoglycemia and 1-d mortality is likely to have limited the influence of other factors that may confound the causal relationship between this metabolic disturbance and mortality at a more distant point in time. In addition, it is important to consider whether the findings from this study of veterans are generalizable to other populations, especially given the predominance of men in this population. Despite the relatively low proportion of women in the study, the absolute number is still relatively large (9928) and offers a reasonable sample of women from which the results can be generalized. Finally, the study is limited by the lack of medication records to elucidate the mechanism by which hypoglycemia occurs in this population. Details of medication use were not available, and such information would substantially increase the analytic complexity of an analysis. CKD is a significant risk factor for the development of hypoglycemia with or without the presence of diabetes, but the risk is greatest in patients with CKD and diabetes. The risk for death, whether experienced in or out of the hospital, is increased within 1 d of a hypoglycemic event. Although the extent to which the increased risk for hypoglycemia is iatrogenic or due to medical therapy is unknown, this metabolic disturbance should be considered an important patient safety outcome in CKD or diabetes populations. This study was supported by National Institute of Diabetes and Digestive and Kidney Diseases grant 1R21DK075675 (J.C.F.) and American Society of Nephrology Student Scholarship grant 2008 (M.F.M. ).